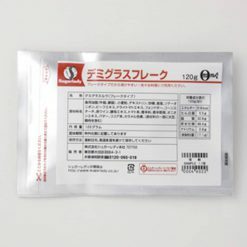 Dissolves easily; can be used in a variety of dishes! Because this demi-glace is in flake form, it dissolves with no fuss, and it is easy to take out just the amount you want for use in a variety of dishes. 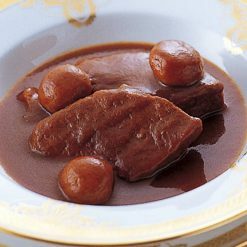 It has the sweetness of vegetables and the richness of Fond de Veau, and is seasoned with the sourness of wine and tomatoes. It comes in a fastenable package for convenient storage. The spices used in this demi-glace are: Paprika, black pepper, celery, laurel, cloves, thyme, cinnamon, onion, garlic. Seasonings such as sauces and spices can be a crucial part of a meal, turning plain food into a delicious experience. After all, sometimes we only think we don’t like certain foods because we haven’t tried them with the right seasoning! Sugarlady’s demi-glace flakes and other seasoning products are safe and free of chemical seasonings and additives, letting the true, natural flavors of the ingredients themselves shine – and allowing you to enjoy your meal without worry. 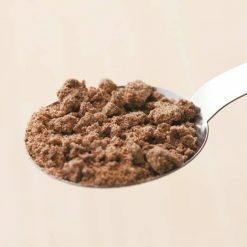 You can use 1 package (120g) of the demi-glace flakes for 5 servings of hashed beef or beef stew. The recipe comes conveniently right on the package! The demi-glace flakes can also be used to make hamburger sauce. After opening the bag, seal it closed, store it in the refrigerator, and use it as soon as possible. This product contains edible fats and oils (beef tallow, pig fat), wheat flour, dextrin, sugar, table salt, sautéed onions, beef extract, dried tomato extract, Fond de Veau, cornstarch, red wine, spices, yeast extract, tomato powder, onion extract, butter, cocoa powder, caramel colorants.. This product is not suitable for anyone with allergies to milk, wheat, beef, soy, chicken or pork.